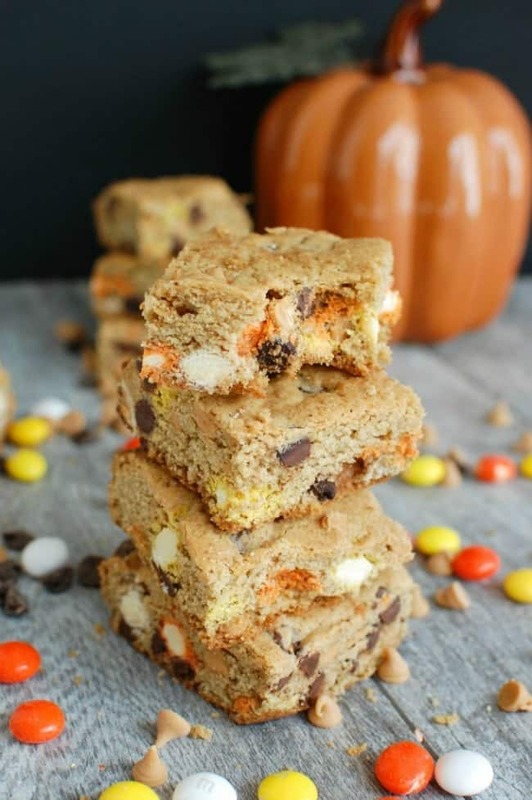 White chocolate M & M’s, chocolate AND peanut butter chips, and a beautiful brown sugar base make these easy Monster Cookie Bars a super fun fall treat! The Halloween Project continues! 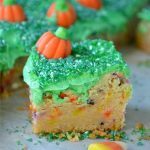 Except these Monster Cookie Bars fall firmly in the “fall” family, so while they are super cute for Halloween, they can be like your un-carved pumpkins and hang around until Thanksgiving. Not that a batch would actually last that long. These bars were made for your Halloween pleasure by Julia at A Cedar Spoon. 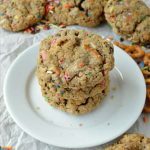 They would be PERFECT for taking to school (no frosting mess like cupcakes) or packing in lunch boxes. Make a pan and haul them to the office! Cookie bars are good for bribing co-workers. I feel like this cookie base (and the name “Monster Cookie Bars”) is pretty flexible — it’s one of those things you could really add whatever you want to, and it would still turn out amazing. You could spook it up with candy eyeballs on top. 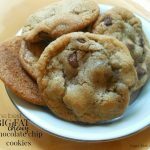 Try butterscotch chips or chocolate chunks. 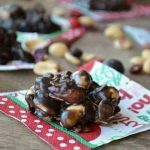 Chop up some leftover Halloween candy and toss it in. I love versatile baking recipes! If you have missed the past recipes for #TheHalloweenProject you can find them below. Lots of fun ideas — definitely something for everyone! And there are several more to come! And Bloody Good Cheesecake from me!